Industry specific functionality provides a more productive and efficient design experience. Helping the designer with intelligent decisions will reduce the potential for error and greatly improve manufacturing productivity. 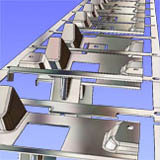 Extensive range of CAD interfaces. VISI can work directly with Parasolid, IGES, CATIA, Creo, UG-NX, STEP, Solid Works, Solid Edge, Inventor, ACIS, DXF, DWG, JT Open, STL and VDA files. The extensive range of translators ensures that users can work with data from almost any supplier. The ability to skip corrupt records during the import process provides a platform from where the most inconsistent data can be managed. Very large files can be handled with ease and companies working with complex designs will benefit from the ease with which their customer’s CAD data can be manipulated. Springback. 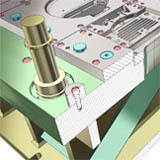 When a sheet metal part is removed from the die, and the forming forces released, material elasticity will cause the part geometry to experience springback. 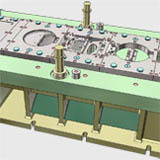 The Springback prediction tool uses the starting nominal part, material data and blank calculation to generate a second mesh of the product geometry including springback adjustments. The designer can then use the relative compensation tool to achieve a morphing on the original surface set to generate the compensated surfaces to produce an accurate sheet metal part. This will provide major benefits to the die market by reducing the time of the ‘design to manufacturing’ process and by reducing the cost of a typical trial and error approach to solving this long-standing industry issue.